My reading was in the ARRL antenna book. 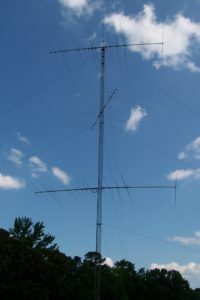 (Low Band DXing by ON4UN, published by ARRL, has some useful information as well). My best resource was a local ham who is a broadcast engineer for a conglomerate of radio stations in our region. He coached me by suggesting steps 4 to 7, and then 8 to 11, in the order that I performed them. I first began thinking of shunt feeding for 80 meters in early spring. At Dayton 2010, I asked Tim Duffy K3LR what he thought. He suggested a minimum radial field of 30 radials, and thought the shorting bar would be somewhere below 40 feet. So at Dayton I bought two vacuum variable capacitors and 6,500 feet of wire for radials. Here is how I did it. Some of the steps are documented here: http://w5wz.com/main/page_my_journal.html See the entries for Sept and Aug 2010 for the overview of the installation. Installing the radials seemed to be the most daunting task. My back yard is a working area – I’m a home builder, and have tractors, trailers, etc and must drive thru the yard frequently. I did not think that radials on the surface was a good idea for me. 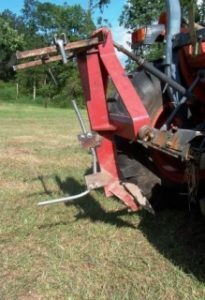 I modified my middle buster plow to be able to bury the radials with it. The result was great! I could bury at 3 mph forward speed. Still, to complete the radial system took about 16 hours. Installed my radial system. 40 radials, 125 feet long, buried just a few inches underground. The wire is #12 solid THHN. 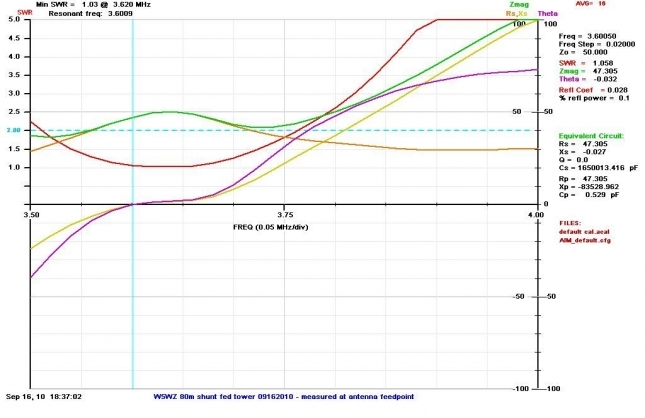 Total wire used = 5,000 feet. 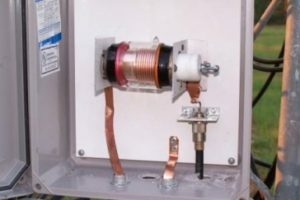 All connections to the tower grounding ring were made using a MAP gas torch and silver solder stick, just like used for soldering copper tubing in an air conditioning system. This method is least likely to corrode with exposure to elements. Installed temporary standoffs of PVC pipe on tower, and ran a shunt wire from the ground up to about 70 feet. This temporary wire was #12 solid bare. It was spaced 24 inches from the tower. Took a guess, and installed a shorting wire between the shunt wire and the tower at about 27 feet. Actually, it wasn’t a guess. K3LR suggested that as a starting point. Using an AIM4170 (available from Array Solutions), I connected directly to the shunt wire (no capacitor in series yet) and the radial field. My goal at this point was to find the 50 ohm tap point on the tower. 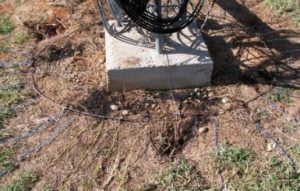 Moving the shorting wire closer to the ground lowers the impedance, higher raises the impedance. I discovered the 50 ohm point was going to be closer to 28 feet. Next I moved the shunt wire closer and further from the tower to find the minimum SWR (no capacitor in series). The goal here was to find the spacing needed for final tuning. Then, using the AIM4170, I determined the R+j (impedance + reactance). In my case, the reactance was purely inductive – and in a range that a single vacuum variable capacitor (0 to 465pF, 5,000volts) would be able to cancel it out. Now I installed my permanent standoffs – top one at 35 ft, bottom one about 24 inches above the ground – made of galvanized angle iron. Holes are drilled every 3 inches to allow adjustment of the shunt wire spacing. I used some large bare stranded aluminum wire (very stiff, it won’t blow around in the wind and change the characteristics of the antenna) for the shunt wire. There is a turnbuckle at the bottom standoff to tension the shunt wire. Installed the shorting bar at 28 feet. It is also made of the large stiff aluminum wire. Built standoffs for the capacitor and installed the enclosure with a single vacuum variable capacitor (0 to 465pF, 5,000volts). I used copper strap for the connections, especially helpful on the output side. Tuning was not difficult; it just took several iterations of adjusting first the shorting bar position for 50 ohms impedance. I did have to tweak the shunt wire spacing just a bid to fine tune the impedance. Next I adjusted the tuning capacitor to cancel the impedance of the shunt wire, and bring the reactance to zero. All the measurements with the AIM4170 were made at the SO-239 in the tuning box (the antenna feed point). How does it play? 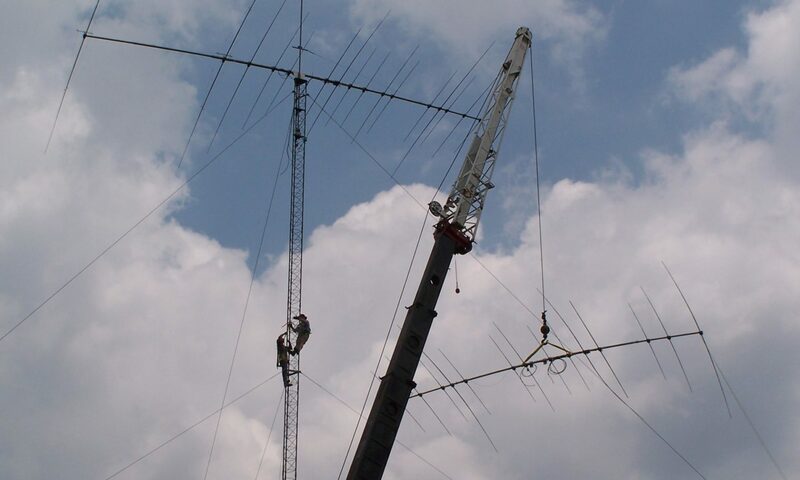 In 2010 CQ WW SSB, we worked 60 countries and 27 zones on 80 meters.